My first flower of the spring came out a few weeks ago. 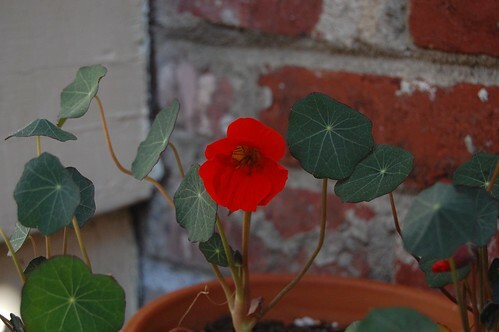 By now the cherry and magnolia trees have past their prime but the bright red Nasturtiums on my porch are still going strong. I brought my camera to knitting last week to do some long overdue documenting of the oh-so-fabulous wallpaper at the Mel-o-dee. The bar was opened in 1969 or so and has clearly been untouched since. 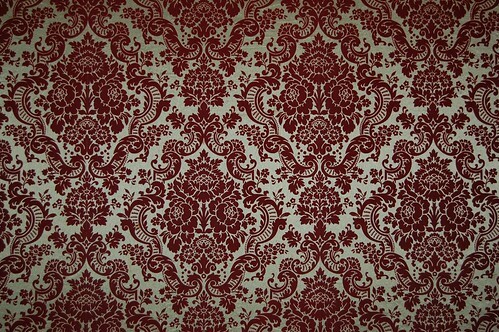 I found three different flocked filigree patterned wallpapers between the two rooms of the bar and the ladies restroom. 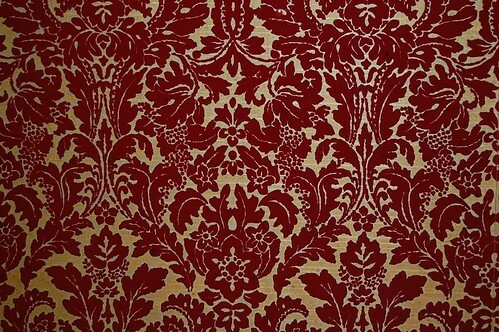 My photography does not capture the atmosphere of the dimly lit establishment, but just imagine this wallpaper surrounding tufted vinyl built in benches and lounge tables. Finally, after drooling over sweaters cut like jackets all winter I’ve decided to knit myself one (with a nice moss stitch front, pattern from DROPS in Ravelry). 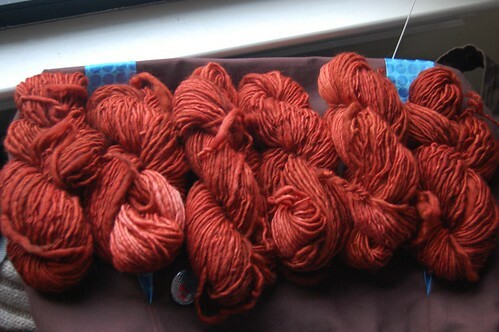 I ordered a bunch of bulky handspun from handpaintedyarn.com in a color called Caoba. I wound up some skeins and started swatching last night. Hopefully I will finish before next winter!